Helen G. Bristow sends a check for $49.50 to complete the $150 scholarship donation that was supposed to be sent to the Berry Schools. 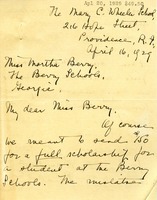 Berry sends thanks for the generous contribution from the Social Study Club and explains why she discourages donors from communicating with individual students. 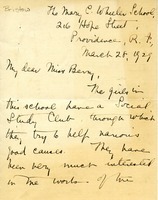 Bristow, adviser to the Social Study Club at the Mary C. Wheeler School, forwards a scholarship donation from the students. 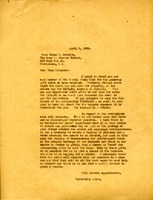 She believes it would greatly enhance the effectiveness of the gift if the students could receive a letter from the boy who benefits from the scholarship.